Is It Important for Writers to Also Be Readers? As an editor and writing instructor, I have the privilege of talking to a lot of writers, at a lot of different career stages. So it’s not unusual for patterns to crop up—ideas, trends, challenges, and myths. Today I want to debunk one of the myths I’ve heard frequently of late. You don’t need to read novels if you want to write novels. You can learn how to write from movies and TV shows. That thunk you just heard? That was my head smacking into my table in frustration. I’ll explain why this myth is dangerous for writers, especially writers who want to create novels. Yes, we can learn some things from movies and from TV shows. We can learn how to create interesting characters that the audience will love, hate, and talk about. We can learn about dialogue (though, even there, you’ll find some differences). Almost anything Joss Whedon worked on would be a great self-study for authors struggling with dialogue. No, we can’t learn everything from movies and from TV shows. In fact, some of the most important elements of fiction writing can’t be learned from a visual medium. The written format brings with it special challenges that we can’t learn how to conquer by watching, only by reading. We can’t learn internal dialogue. In fact, we can’t learn anything about how to convey the internal life of the character—their thoughts, visceral reactions, or unspoken motivations. We can’t learn description. In movies and TV shows, the audience sees what’s happening around the characters and they see what each character looks like. As writers, we have to build everything we want the reader to imagine with our words. We can’t learn proper written story structure. Some elements of structure are the same between movies and novels…and some aren’t. For example, movies have the freedom to start more slowly than books do because, once you’ve bought your ticket and you’re settled in with your popcorn, the movie would have to be pretty bad before you’d walk out. If the start of a book is slow, you’ll never buy it in the first place. We can’t learn how to balance description, action, dialogue, and internalizations. As I mentioned just a second ago, there isn’t any internalization in movies and TV shows (voice overs don’t count). The description is automatically taken care of. The actors fill in the action. So we can’t see how to weave them together on the page to avoid spots that either drag or leave the reader feeling disconnected from the character or the world. We can’t learn how to maintain a consistent point of view. Point-of-view errors are non-existent in a movie or TV show. In a book, maintaining a consistent point of view is integral to keeping a strong connection between the reader and the viewpoint character. We can’t learn how to actually put words into tight, interesting, clear sentences. Just because someone wants to write a book doesn’t mean they were born with this skill. Most of us have to learn it. I could keep going on the differences, but here’s the bottom line. For novel writers, movies and TV shows can be good supplements, just like vitamins supplement our regular diet. They’re not a fitting replacement for the regular meals of reading novels. Writers write. Writers also need to read. What do you think? Is it essential that someone who wants to write a book also read books? I agree with you completely and have heard the sentiment. It’s another side to the oft stated confession that someone wants to write a novel, but doesn’t like to read. That’s difficult for me to wrap my brain around. How can those two desires coexist? It’s like wanting to become a musician with no desire to listen to music. The root problem is the common belief that anyone can sit down and right a novel anytime they want. It’s easy. 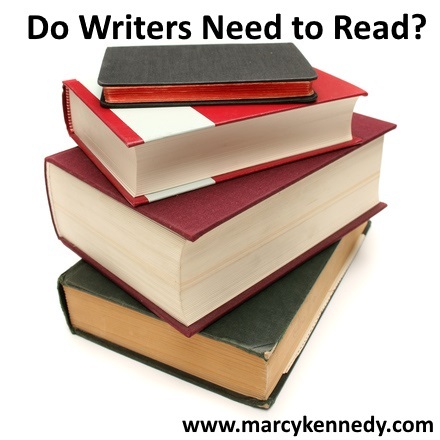 People write all the time so why should novel writing be any different? H’m. Fly a plane? No problem. I drive a car every day so I could fly a plane anytime I want. Five years ago after I’d published my first book, I had a conversation with a very good friend which went something like this. And that was the last conversation on the subject we’ve had, and no, she’s still not written her memoir. This cracked me up! It’s right along the same lines with the conversation where someone has a great idea for a book and they want you to write it. Great post Marcy 🙂 And great timing for me lols. Just a few weeks ago I decided to start reading in my genre again and I”m loving it. I was worried that I’d absorb words and voice from other writers if I read in my own genre while writing myself. So I’ve been reading historical, crime, horror … just about anything except fantasy! Hopefully now I’ll get back to a nice balance of all the genres I enjoy.